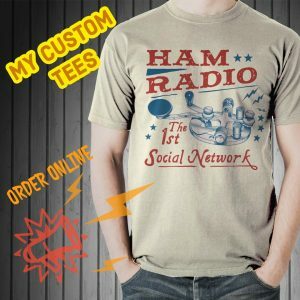 In this one we use the old free version of Ham Radio Deluxe. Icom 7300 Ham Radio Deluxe Setup is so easy and in this example I use a couple of cables. Why use two cables? Because I want to use the radio to it’s full capability while keeping it simple. Yes, In the long run I believe two cables are easier than one. 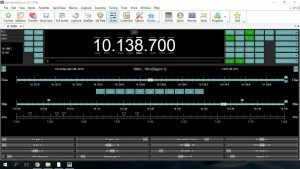 Ham Radio Deluxe has been my go to software for rig control, logbook and digital mode operation for many years now. It was originally developed by Simon HB9DRV and Peter PH1PH. Free to use for years and now available for purchase and technical support. The free version is what I use here and is still available here. So if you’re interested in the “swiss army knife of ham radio” and using it with the Icom 7300, you’re in the right place. Two cables are used in this setup. One is the USB cable connected to the radios USB port and the other is a CI-V cable connected to the radios CI-V port. Use the CI-V for rig control and the USB for the soundcard. I have found this to be the easiest, because later on I added cw keying and RTTY (FSK) to the mix. If you just want to use a USB Cable with HRD and operate some PSK31 or RTTY (AFSK), take a look at this video. Step one, if you haven’t already, download and install the latest USB driver from Icom for your Icom IC-7300. Do not connect the USB cable until you have downloaded and installed the driver. Step two, connect both cables. Step three, setup the Icom 7300 using the radio’s menu. Set the following menu items under MENU>SET>Connectors. These are the changes, leave everything else to default settings. I have included a couple of extra settings that will help later on when using PSK31, RTTY (FSK) and CW keying. Step four, if you don’t already have it, download and install HRD. For this tutorial we will be using the free version. You can download and install the paid or trial version. It shouldn’t be much different. The paid and trial version has the IC-7300 listed under radios, where-as in the free version we will choose the IC-7700 and alter the CI-V address. Step five, start Ham Radio Deluxe and on the Rig Connection Screen choose the New tab. Next to Company choose ICOM. Next to Radio choose IC-7700 (IC-7300 if using the paid or trial version). Next to COM Port choose the CI-V port (mine is COM6 and you can look under Windows device manager to find the correct Port, look for Prolific USB-to-Serial Comm Port). Next to CI-V Add enter 94 (94 if using the free version, if using the trail or paid version the correct setting will automatically be selected). Under Flow control/Interface power, uncheck everything. Double check everything listed and make sure the speed is still at 9600. I usually choose to start Digital Master 780 and Logbook at startup, so you can check those off to the right if you like. Click Connect at the bottom left of the window. You should now be connected. See the video below for a visual. My next article on DM780 for PSK31, RTTY (AFSK) and CW. Thanks for dropping by and looking at the Icom 7300 Ham Radio Deluxe Setup. I hope you find this interesting and useful. I bought my new IC 7300. Tried to connect to HRD free version using USB cable. The radio transmits continuously for some seconds when HRD is opened. Nothing is working. Nice ti hear from you and thank you for commeting here. It is probably just RTS keying the rig. If your radio is setup like mine. Uncheck RTS in the HRD Connect window. Here is some more info and screen shots. I just got the latest HRD and am trying to use WSJT-X with it. There is a problem with the radio switching to USB from USB-D intermittently, and frequently. When that happens, the radio goes into transmit, but there’s no output because the radio is looking for audio from the microphone, not the USB input. When I kill HRD Rig Control and go back to having WSJT-X talk directly to the IC-7300, it works fine. I’m thinking there must just be some setting somewhere that I’m missing. Nice to hear from you. You’re reading my mind, Ha! I’m doing a video right that includes that issue, because I have it too. Quickly, in WSJT-X if you are using Ham Radio Deluxe for the Rig, use “None” for the Mode. I set the mode with either HRD or the front of the radio. This has been working for me the last two days. See if that works and please have a look at my Youtube video coming out tomorrow. Thanks for the reply. I may try your solution, but for now I found the serial CI-V cable I’d bought way back when and have WSJT-X talking to the radio directly using that, while HRD talks to it via USB. No problems with that arrangement so far. Nice to hear from you and thanks for commenting. I do appreciate the input. I use my CI-V cable a lot too. It’s connected to my 7610 at the moment and being used for Omni-Rig. I like your arrangement and do the same. With the new HRD out I thought I would give it another try and so far it’s been good. Thanks again and best wishes to you and yours. Are you using the same COM port for CW keying as you have for HRD rig control? In that article I was using two cables. One for rig control (HRD Connect) and one for data (DM780). My apologies if this question has already been asked. The two links that you provide for the CI-V cable send me to ebay but the description for either one doesn’t list the IC-7300 as a supported radio or Windows 10 as an operating system. Is it safe to assume these are the same cables you intended to recommend? Yes, the one is a CI-V cable and the one I am currently using. The other is a USB and it has ferrite on it. I am not using that one, but it is similar to the one I use. If you have one laying around it’ll work too. You can add your own ferrite which is probably a better solution. I also have a CI-V I bought off of Amazon and it works just as well. It is a FTDI chipset. Some people say this one is better, but I haven’t noticed a difference. It’s just more expensive. CI-V on Amazon. Followed your setup to a tee. Works great once I figured out I had to click on the “use hrd to run rig control” in the options area in 780. I have been using a rigblaster advantage with my FT-950 for ft8 and jt65 which I’ll continue to use. I missed using HRD but can’t use it for ft8. HRD is a stellar program. Thanks for walking me thru with your tutorial. Nice to hear from you and yes that’s an important point. Thanks for sharing it. Thanks again and I hope to hear you on the air. Nice to hear from you. Congratulations on the Icom 7300 and thank you for commenting. Step one, if you haven’t already, download and install the USB driver from Icom for your Icom IC-7300. USB Driver (Ver 1.2). Do not connect the USB cable until you have downloaded and installed the driver. Step four, start Ham Radio Deluxe and on the Rig Connection Screen choose the New tab. Next to Radio choose IC-7300. How are we doing so far Gordon? Does HRD connect? Hi Rich, yes tried to install before connecting. I will do some more research online to see what I can learn. I will post whatever I learn here. Okay Jeff, that sounds great. I know people had trouble if they connected the cable before installing the driver. I don’t know for sure, but it may require uninstalling the existing driver and reinstalling the correct driver. I’m sure you’ll get it. Please let us know. HP makes a good laptop. Did you install the driver before connecting the cable to the rig and computer? Thank you for commenting and thank you for watching the videos. Are you on a 64-bit system? I would assume you would use the _x64 installer, but you could try the _x86 installer? See if that works. Tnx for coordinating the cabling requirements. I want to present my wiev to interconnections. I am using Win7 which sound properties is torso. I wanted to hear via desktop line level speakers audio and music from internet, my Audacity recordings, system sounds, Skype, HDSDR output, monitor my digital on-air audio ect ect. I found it uncomfortable if using only 2 cables. TX audio is possible to monitor by IC7300 monitor but it isn’t as nice as via speakers with easy to use volume control. If I wanted to listen something via desktop speakers I had to play with default selection. Selection had to be changed back and forth from USB Audio Codec to analog audio (in my case integrated Sound Max) card depending on use. There exist no such problem with audio from rig to computer (Windows rec). USB Audio Codec is OK. Therefore I use a cable in ACC socket for 3.rd connection having line transformer as groundloop isolator. It easy to make with included Icom prewired Din13 plug. In Icom manual is clear advice for wiring. In my case only 1 transformer was needed and I didn’t use any potentiometers for line level. A 3.5mm female cable model socket is in parallel for desk speakers. Old HRD is comfortable to use after swapping useless buttons over gunwale. It’s very nice to hear from you and thank you very much for the comment and information. This will be very helpful to Hams. I have not considered using the ACC, but I like what you are doing with it. I will check into what you have said about the ACC socket some more. Thank you again and please let us know any future additions. I hook up 2 cables yesterday using hrd had Data off mod to usb to your setup. Today opened N1MM the radio keyed up i changed port real quick. Did all the setup like you did.But radio would not TX. Now it TX with N1MM AND HRD. Is this a USB driver problem. Nice the hear from you. You have it right. As these posts progressed and I got N1MM Logger and then a few others working the settings are DATA OFF MOD = Mic, ACC. Actually that is the default. 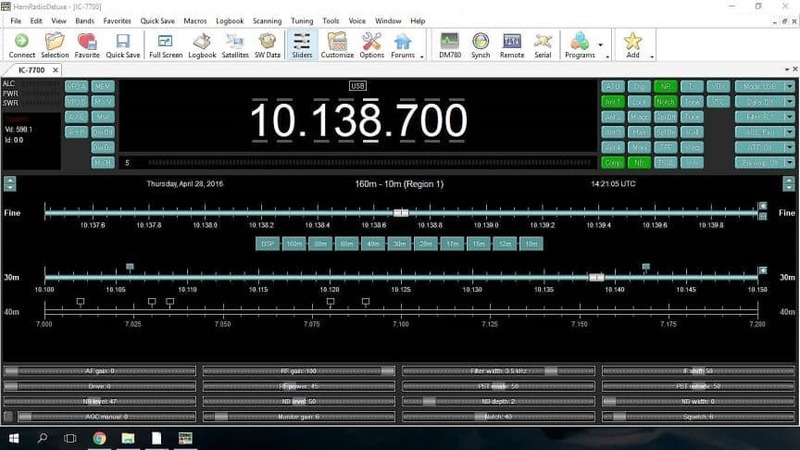 If you like, see N1MM Logger Plus Setup and RTTY FSK and MMTTY With N1MM. I have used FSK with HRD and DM780, but it is a little quirky. MMTTY works great if you like RTTY (FSK). Others say so too. I have found it to be a lot of fun combined with N1MM and just a general log. Nice to hear you got it working Joe. Have a great weekend and thanks for commenting. Best 73 – Rich, K0PIR. P.S. Here are some screenshots from the N1MM Logger Plus Setup. Mine are slightly different now, but those work. I just installed the trial version of HRD with a friends IC-7300. It always makes me nervous hooking up unfamiliar technology with my computer. As the IC-7300 is very expensive. Anyway I get it connect and I can control the 7300 with the laptop, but within 10 seconds of sitting there the IC-7300 goes into “standby mode” and just clicks. I have to wait till a couple a minutes then I can turn the device back on. But then the same thing occurs again. I followed the settings you laid out to the “T”. My configuration is a HP Laptop running Windows 10, HRD 6.4. Any ideas about what could be going wrong? Nice to hear from you. Sounds like you have a communication error. Are you using just the one USB cable for rig control? If so, when HRD comes up with the connect window (where the radio, port, baud, etc. is entered), try unchecking RTS. If that doesn’t work, let me know your cable setup, version of HRD, etc. Well I finally had the time/guts to try it, after vacation and the nerves to change things on the rig and software. I followed your instructions on the video, except the Split part (I don’t see the need for that at this time, nor do I understand it). So I left it clicked “None” for that part on WSJT-X. Everything else I followed to the letter. I am happy to say that it is working optimally! The ACLog, WSJT-X and JTAlerts all are performing as they should (I did a lot of jumping back and forth to make sure). Smooth transitioning, no hiccups! I want to Thank You again for helping me and for posting the video for others. Nice to hear from you and thank you for taking time to comment. I have found that I like the “Fake it” mode best under split operation no matter what accompanying software I’m using with WSJT-X. If you select it, you’ll see that sometimes while transmitting the freq, will go either up or down a bit from the receive freq. It works FB on these radios and HRD. Glad it all worked for you and hope to hear you on the air. Thank you again for the kind words. Funny thing… I have been replying to you on my Kindle and haven’t checked it for sometime (nor trying setting up the rig, been really busy), so I happen to open it this evening and the browser tab was open to a YouTube video of connecting CI-V to an IC7300 I must have been searching. Below it in the suggestion videos I saw the title “Icom 7300 N3FJP WSJT X… then I realized that it was yours with me credited! I will follow your instructions on the video and let you know in a couple days how it turns out. P.S. I’ve found I like using “Fake It” for split operation. If I connect the CI-V to N3FJPs ACLog and the USB to wsjt-x. Can I operate the IC7300 independent of each other? So when I am looking for Qs digitally, can I switch to a new juicy DX when I see it on the ACLogs DX spotting without the two conflicting with each other? Yes, if I understand you correctly you can. I can do that with HRD (CI-V cable) and WSJT-X (USB cable). Well I tried to run both… Got Conflicts. WSJT-X wants to be the dominant user of the radio. I tried it both ways… CI-V to ACLog and then to WSJT-X. Same problem, unfortunately, either way I connect them. I will give it another try. I must be doing something wrong. I’ll look over the manual again. It could be the programs, and it just won’t work. Do you have another ham program in the background that may be interfering with it? I will see if I can try ACLog and WSJT-X. I have a license for all of his software. After unlink, the only thing I changed was the CI-V USB Baud Rate, mine is 115200 (You’ll need it set that high for programs that show the bandscope). The other thing I changed (I think) is CI-V USB Echo Back. I turned it ON (default may be ON). I ran ACLog and WSJT-X with JTAlert and didn’t have a conflict. ACLog is using my CI-V cable and WSJT-X is using my USB cable, rig is the Icom 7300, baud rate 115200. When I set the radio to “Link to [REMOTE]” it did not work. WSJT-X gives the communications error. Take a look at your rig and see if this works for you. Rich, You seem to have more info on your site than I can find on HRD.I am looking to connect my IC-7300 to the latest version of HRD. Unfortunately they want another upgrade to activate the 7300, so I will try your IC-7700 method. I am currently using HRD with a FTDX3000. It also uses a Silcon Labs driver. ICOM says to delete the old drivers and install theirs, but won’t this mess up my operation of the FTDX 3000? I tried installing the ICOM drivers without deleating the Yaesu drivers, but it said the new drivers were not an upgrade and did not install.Any suggestions? Yes changing the CI-V address should work for you. The “Icom 7700” will show up in a few things, but it didn’t really bother me. One place was in HRDLog.net. It said my radio was the Icom 7700 hi hi. I would think that uninstalling the Yaesu driver would break something. It sounds like you are using one USB cable and swapping it between radios??? I wonder if a dedicated USB cable to each radio would solve anything. Currently I am using a Silicon Labs CP210x USB to UART Bridge driver and it is dated 6/8/2015. Driver version 6.7.1.0. It’s a Windows 10 computer. It works FB.I think originally when I installed the driver from Icom it was a 2012 date. What do you have? If you have much trouble, it may be worth getting that CI-V cable for rig control and use the USB cable for the sound card and modes like PSK31. My drivers are the same date and version as yours. The FTDX-3000 only requires one USB cable and has 2 com ports according to instruction sheets. Com 3 is used for data and Com 4 for PTT. I chose Com 5 for the IC-7300 in the HRD connect screen. I do not recall the Windows 10 computer telling me it was installing drivers when I connected the 7300 to the computer via a second USB cable. I now have a separate USB cable for each radio (both connected). When I read your email I went to Device manager – Ports (Com & LPT) to get the driver info and noticed only Com 3 and 4 were listed. Com 5 was not there. I am wondering if I am actually using the “Audio Drivers”. It does seem to work Rx and Tx. However, When I disconnect from one radio and connect to another HRD controller and Logbook seem to work OK, but DM 780 retains the previous PTT and some Modes and ID settings. It also appeared that data was not getting to the waterfall for decoding. Another question does the Silicon Labs driver get downloaded to the Radio or computer sound card? If I was going to try reinstalling the Silicon Labs driver for Com 5, how would I do it? I can’t be the only person with this problem!! I would watch device manager as I unplug and then plug back in the cables from each radio. See which one is for the Icom. I don’t know how DM780 would work with two radios, that sounds interesting. I’d check with HRD support forum. Sorry I’m not much help on that. The driver is installed in the computer. You can see when it was installed by going to device manager>Ports>Silicon Labs CP210x, doubleclick on it and then select the Events tab. The sound card that we use is actually the radio, we’re not using the computer sound card for digital modes. You shouldn’t need to reinstall it as long as it’s working and no problems are detected with it in Device Manager. One way to reinstall: You can select it in Device Manager, right click on it and then select Uninstall device. Restart the computer and it will reinstall when it is detected at startup. It may show up as a different COM# though. Try my first suggestion by unplugging the cables and then plugging them back in while watching device manager. Thanks, you have been of great help. I tried plugging and unplugging the cables as you suggested and Com 5 did show up as a Silicon Lab driver which is the Com port I used in the HRD connect screen for the IC7300. Interesting my FTDX-3000 Com 3 an 4 ports show up as “dual” CP210… and “Enhanced” UART Bridge”. All dates and versions for all Com ports are the same as yours. Thanks for the sanity check. I’ll go to the Q and A of HRD AND LOOK FOR RESOLUTION OF THE dm780. its unfortunate that HRD requires $50 for a years support. I have already done that twice in the past to resolve problems that were theirs and not issues on my end. Yeah Jim I remember now another Ham saying the Yaesu shows up as two. Thanks for the information. Hopwfully this helps another Ham. HRD rig control is fairly good but several of the controls do not seem to work, specifically NB, NR, Notch that I have found so far. Also there is no USB-D on the mode drop down. I will have to move on to setting up RTTY and JT-65 now. That’s great. All of mine work NB,NR and so on. I don’t ever remember having an issue with that. Yeah, no USB-D 🙂 I want to save USB-D in my favorites and use from the drop down. I think HRD told me that they couldn’t do that with the 7300, but Mac logging software does. You could put in a support ticket with them and see what turns up. Tell them we want USB-D 🙂 hi hi. I was at 9600 already. I did a reset of the 7300 and reentered all the Connection settings, adjusted the Codec sound settings on the computer and it seems to be working as long as they are 40 or less. However the PO is very low , at 100% radio power the meter only shows 25. Two other interesting things: When I start HRD my S reading goes from <3 to almost 7, and the waterfall on DM 780 does not cover the full width, only about 50% of the width shows in the center. 4. Transmit Slider in DM780 approx. 15% up the scale. My TX power output is 45 watts and I control the power out with the slider in DM780. Did you try zooming out on the waterfall? There is a button on the waterfall toolbar that allows you to zoom in and zoom out. Mine is set to x1 and I have 200 to 3300 Hz showing. Also look in the DM780 options, under Waterfall then Frequency,Mode,Speed tab.There is a Passband setting. Mine is 200Hz to 3300Hz. I use FIL1 on my radio and it is set to the maximum of 3.6k. Well yesterday, for no explicable reason, PSK started working reliably! I am still scratching my head but have recorded all the settings. I did replace the USB cable and the noise went away! Interesting as that was the cable I use on my Signalink at my other QTH. It had been giving me problems too. I still can not get more than about 20 w output to show on the power meter, but I will carefully work on it. My CI-V cable should be here any day and I hope the addition will not cause problems. BTW I seem to have full radio control with HRD with just the USB. Though I haven’t tried all the options. That’s great and sometimes that’s exactly how it works for me. I suspect software, but who knows. Yes, mine works with just the USB cable and I started using the CI-V so I could transmit FSK. I like RTTY contests and using N1MM with MMTTY. The way I have HRD setup with the CI-V cable and USB Cable is simple. In the HRD connect window I use the CI-V port and in DM 780, it uses the USB Audio CODEC for sound. So rig control uses the Ci-V and the Audio apps use the USB Audio CODEC. Every piece of software is similar. CI-V for rig control and USB Audio CODEC for sound. I don’t know why you are only getting 20 watts out. It’s probably a silly question, but did you look at your SWR? I am having great difficulty getting connected. The Silicon Labs driver is downloaded and installed. I have also changed the USB Send to off. Looks like you have the correct settings. Try updating to the latest version and let me know. Well it’s okay now. I don’t know why it was asking me for my activation key. I restarted the laptop and it is working. Everything seems to be working. Try restarting your computer if you haven’t already. Are you sure you don’t see the IC-7300 in the drop down list? No, there was no 7300 listed on that version. However I upgraded and there it was! That got me connected. I am receiving OK but the radio dues not key up to transmit. Soundcard is set to USB Audio Codec fro both send and receive. That’s great Steve. Are you in DM780 and using Ham Radio Deluxe for PTT? I just tried to update and it lost my activation key??? Well after going through all the settings again, and again, and again, Hi Hi, I checked your second blog post and found that it REALLY helps to set the radio to USD-D!!!!! And to set the Modes & ID’s. However I can send CQ several times OK then the next time it locks in TX, but shows no PO. I have to power down the radio to stop the TX! That’s great news Steve. I was trying to send PSK31 in USB mode yesterday by accident and it just will not work 🙂 It has to be USB-D.
What CPU and how much memory does your computer have? I would try running HRD & DM780 by it’s self with no other programs open and see if it locks up. Sometimes something in the background will cause problems. Celeron 2.2 ghz 2mb RAM, I have never had problems with HRD on this computer operating my FT450-D though. I have gone through both the Connectors Menu and the DM 780 settings changing things and nothing has changed it from keying the radio but no RF power output. Radio also locks in TX mode and I have to hit the power button and start everything over. Is HRD still connecting and just DM780 not working? If you are using high speed, can you try something lower, say 9600 on the port and in HRD. Slower can be more reliable. If you’re sure all of the settings are correct, try restarting the computer. I had to do that today to get mine to connect again. One other thing to be aware of is that there are apparently two different chipsets used to make up the CI-V cables. The first is the Prolific chipset which apparently has a lot of knockoffs (not true Prolific brand) and some of them are pretty shoddy. They simply won’t work properly. The second is the FTDI chipset which I understand is more “stable”, but the drivers are not as robust if you are using more than one FTDI cable per computer. I went through this when hooking up a Yaesu FT-450D for CAT control. The plug on the Yaesu is a RS232 so one needs an adapter cable with chipset to make the USB connection to the computer. Separately, I heard my first Contestia CQ today while using DM780. I tried to respond, but the IC7300 wouldn’t transmit. I’m using just the USB cable at present. I was puzzled why I couldn’t respond until I read this article, then the light came on. I think I too will opt for the two cable setup. Thanks much for sharing your wisdom. Thank you for commenting and excellent point! I still have an old cable in my vehicle with my 7000. It tends to give me problems occassionally and I should just buy a new one. The link I have to the CI-V cable is the one I use with the Icom 7300 and I haven’t had any trouble with it. That being said, a search specifically for the “FTDI USB CI-V” cable provides a few good results. It is probably worth it from what I have read. Thank you again and best 73! Hope to hear you on the bands. Using 2 cables. Also using SignaLink sound card. Restarted computer. Com 5 did not show up in device manager. Opened HRD connect. IC-7300 shows in both Com 3 and Com5. However Device manager has SignaLink using Com3. Com 5 connection won’t work. Seems I am going in circles. When you go to Device Manager you’ll see two com ports. One is the Prolific USB to Serial and the other is the Silicon Labs CP210x. Prolific for rig control (CAT) and Silicon Labs is for sound (data). Your radio is the sound card. It’ll work! Just have to get the connections going. I am attempting to set up HRD v 6.3.0.613. Encountered a couple of problems. Computer shows rig connected to COM 5, but that won’t show up on the rig connect screen of HRD. Get error msg “The system cannot find the file specified”. Also rig switches to TX when HRD is activated. No way to turn off. Tried suggestions from posts above, but no success. Are you using one or two cable? If you are just using the USB cable then in the Icom 7300 menu under connectors see what USB SEND is set to. For just a USB cable set it to OFF. When the HRD Connect window comes up it should have RTS checked. Are you using two cables? Let me know. Thank for the details… I am using the USB only and have toggled between DTR, RTS, both on both off, and each one one. The IC-7300 still goes to TX after about 3 seconds. : any suggestions? I will get a CV-I cable if that will correct the problem. USing a Dell E6550 with Win10 OS. and IC-7300 firmware is updated. What version of HRD Phil? There was an issue with HRD 6.3 and an update solved it. When using DM780 for RTTY (FSK) do you have the IC-7300 set for RTTY or DATA ? When using DM780, I have the old (free) version, so it is set to DATA. If you have a new version 6.0+ I believe it will do FSK. Thank you for the detailed article. I believe I followed all of the steps; however, HDR becomes unresponsive once I press connect. Any ideas what I may be doing incorrectly to cause this connection problem? I’ve verified that the USB port is set to 9600 bps. I’m running HDR 6.3.0.501. If it locks up on you I would say you have a comm port problem. Restart the computer. Make sure you’re using the correct comm port. Also, try alternating RTS & DTR settings in the connect window. Does it give you an error message? Did you get it working? P.S. HRD 6+ requires quite a bit of RAM and processing power. Does your computer meet the requirements? I have had the DM780 working and have made several QSO’s. I wanted to add CW so I purchased a CI-V cable and followed your instructions with HRD ver. 6.30.557. Now when I transmit I se a yellow vertical line on the radio instead of red and I am not getting out. What should I change? You should be able to hear the code being sent. Your power meter will kick up too. Use the Audio Scope and you should see the transmission. Is that happening? I followed the steps above when setting up HRD 5.24 and the rig control seemed to work on first try however it put the IC-7300 into transmit. I was not able to put it back into receive without turning power off. Any suggestions? Did you get it to work? Try alternating between DTR and RTS in the HRD connect window. ’73 for all de KI4RMF Fred!!! That did it, thank you for your help. It is clear I have much to learn and I’ll give it a go. Please forgive me for getting your name wrong…what a goofball. I’m new to the radio and the idea of control via computer which I find interesting and I am willing to try and make work. Please help me understand what Icom is saying on page 2-3 of the manual under the USB description. The first bullet states “Remotely controls the transceiver using CI-V commands”. Words to this effect are used on the remote jack as well. Can one operate the radio using just the USB port with HRD version 5.24.38. When I tried this for the first time the rig went into transmit 3 seconds after the connection was made. Thank you for any help you may have and I realize it is not your duty to school the newbies. Yes you can use the USB to control the radio. I think I understand your problem. When pulling up the HRD Connect screen choose Icom, IC-7700, “your com port”, “your speed”, CI-V address of 94 and choose DTR instead of RTS. After choosing DTR go back and make sure the speed is still correct. Then try to connect. Rich, thanks very much. It’s very helpful. The Prolific driver version I’m using is 3.3.81.357 and the date of the driver is 9/4/2015. What interface do you use for the PC to CI-V jack on the IC-7300? USB to RS232?